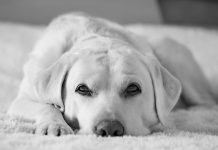 In this article we are going to look at dog doors for Labradors and other larger breeds. 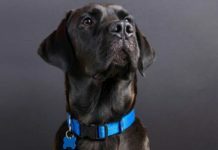 Helping you to choose between the best dog flaps for Labs, and pick the perfect choice for you and your dog. 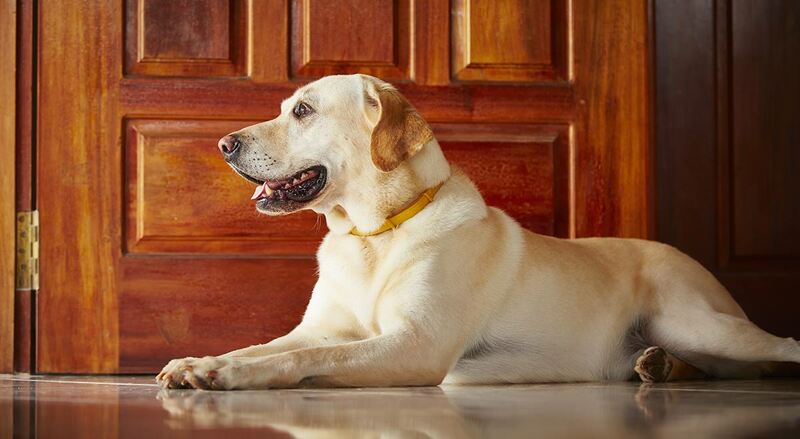 The best dog door for your Labrador will depend upon a number of factors. [wp_ad_camp_5]These will include where you want to fit it, how big your dog is, when you what him to be able to use it and what your security concerns are. 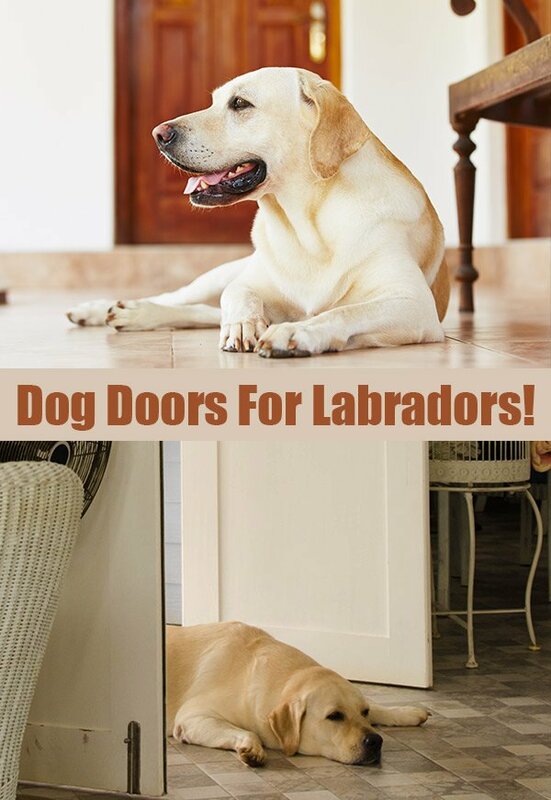 Different dog doors are designed to fit into different locations. Some are designed to work like a cat flap, inserting into your back door, others will fit in with your sliding glass patio doors. 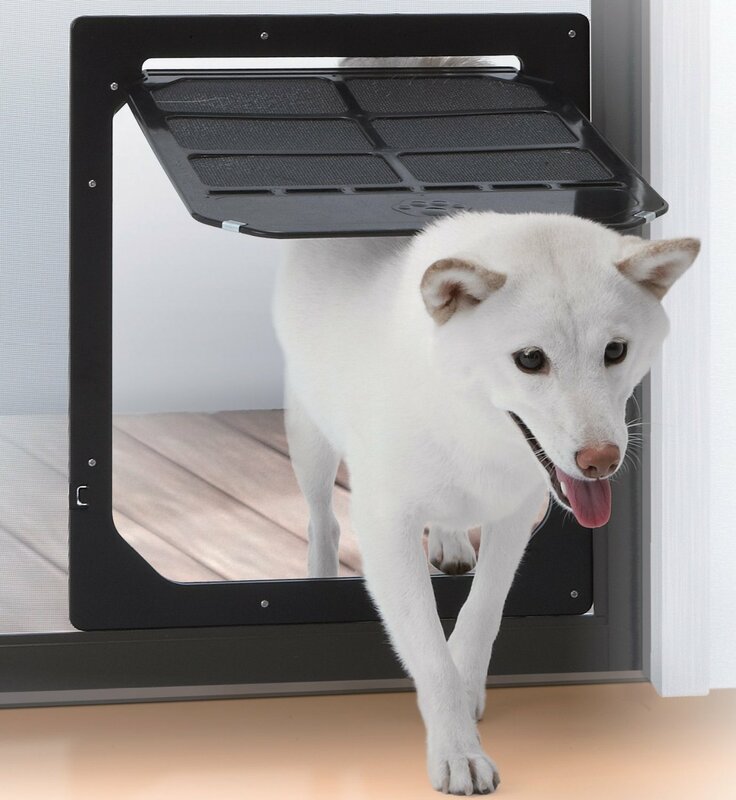 You can even get dog doors to install into the wall of your house. 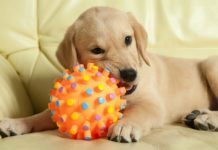 Let’s have a look at the different options out there, so that you can pick the design you think will best fit in with your dog and your life. Dog door flaps are just like cat flaps, but of a great size and sturdiness to accommodate your Labrador. You can fit them into your existing door, or buy a new door with one already installed. Dog door flaps come in a few different varieties. 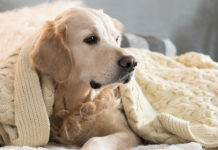 Your choice will depend upon whether you want your dog to have constant access, how secure your property is and what the weather conditions are like, as well as your budget. 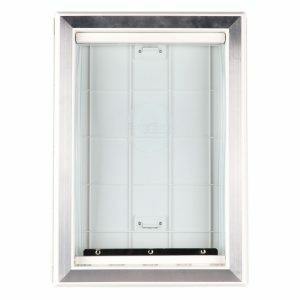 The Ideal Pet Products pet door with telescoping frame is a popular and very well reviewed choice of dog door flap. It has a sturdy impact resistant frame, which can be installed yourself into any door ranging from 1.25 to 2 inches thick. The installation can be carried out yourself, and they even have a video demonstration of one being fitted that you can follow along with. The clear vinyl dog flap is designed to stay the same shape regardless of the weather, and it comes in a range of sizes, catering for dogs up to 90lbs. You also have the option of buying an additional lock-out slide, which will keep your dog inside or outside if you need to. 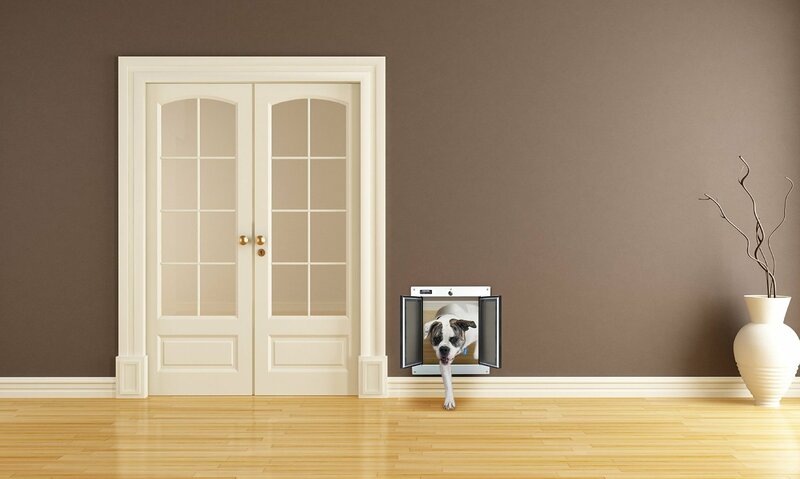 Find out more about the Ideal Pet Products Original Pet Door here. This Heavy Duty Dog Door is made of a hand die cast alunimum frame, with heavy duty spring hinges and a plexiglass dog flap. It’s large size and opening couple with it’s sturdy structure means it is suitable for dogs up to a massive 120 lbs in weight. The frame and flap are weather tight. They are also practically indestructible, with even the door being chew proof. A must when left with unsupervised access to some mouthy Labradors! Find out more about the Heavy Duty Dog Door on Amazon here. The Extreme Weather Dog Door by PetSafe is designed to withstand the elements. It has a unique 3 flap system with a central insulated layer, perfect for maintaining your house at the temperature you choose. Whether you live in a very cold or hot climate, this door will keep the air trapped inside your house, allowing your heat or air conditioning to continue to do it’s job. This door comes with a snap on closing panel which can keep the door locked if you don’t want it to be used, and an additional weather protecting panel can be brought separately too. The plastic frame is even paintable, so you can match it with the color scheme of your door. This dog door comes with extensive detailed instructions to help you fit it yourself at home, including a template to use on your current door to make sure you get the cutting area just right. You will want to invest in the large size of door for the average Labrador. You can find out more about the Extreme Weather PetSafe Dog Door here. The BarksBar Large Plastic Dog Door has a heavy duty flexible vinyl dog flap, that closes securely with a magnet. 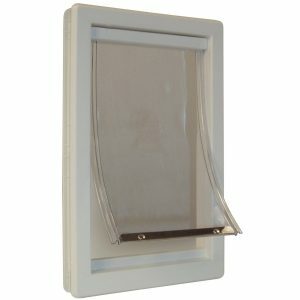 It can be installed in any door between 1.25 to 2 inches wide, and has a white plastic frame with an aluminum lining. This magnetic dog door is suitable for dogs up to 100 lbs, so should easily fit any Labrador. It also has a removable self-locking slide panel, to keep your home secure when it’s not in use. 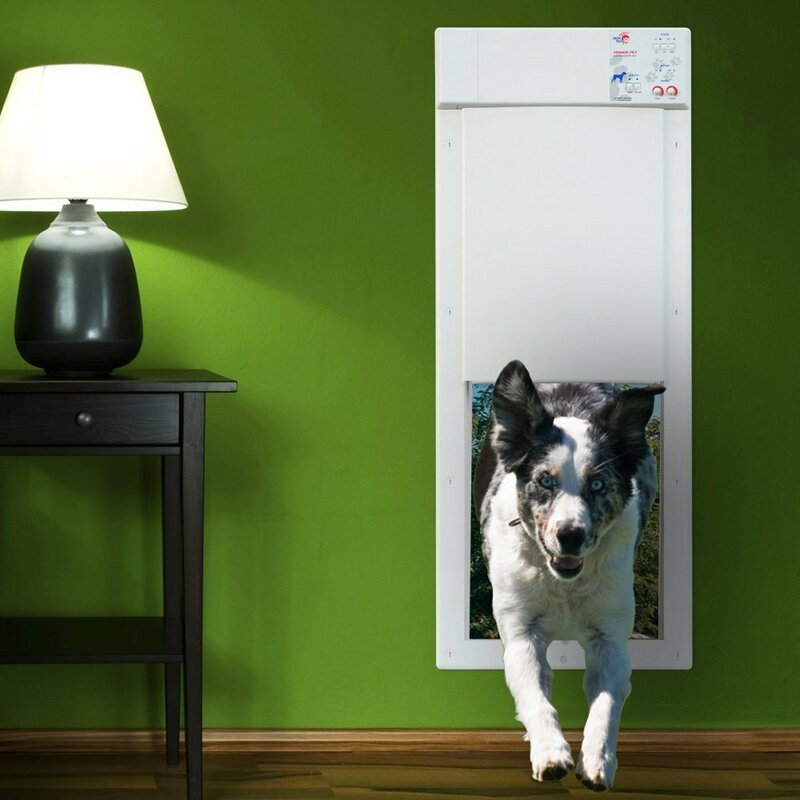 To find out more about this magnetic dog door, visit their page on Amazon here. Electronic dog doors work through your dog’s collar and a remote control that you keep nearby. The door automatically opens when the dog approaches, meaning that you have a safe secure point for them to access the backyard, which does not open unless it needs to. 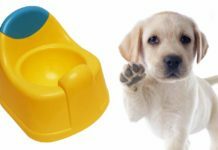 The High Tech Pet Power pet electronic dog door is a motor driven dog door which slides vertically upwards when activated by the ultrasonic collar that your Labrador wears. It is able to sense whether your dog is walking directly towards it, so it won’t activate when he is just sauntering past or if he relaxes on the floor beside it. You have four options for your Lab’s use of this automatic dog door. Making it possible for him to only enter, exit, do both or neither. When in the closed mode the door is locked and will not open. It is secured with an automatic deadbolt for heightened security. This electronic dog door has a panel 12.25 x 16 inches, and should fit any Labrador being suitable for pets up to 100 lbs. This door is weatherproof and airtight, keeping your house free from drafts. You can find out more about it on Amazon here. You might be surprised to hear that there are options for getting a dog door for your sliding glass door. 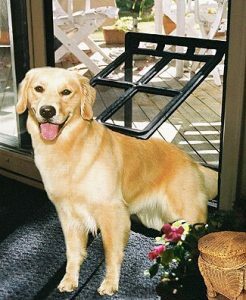 Sliding glass dog doors are a great way to easily adapt your living space to suit your Labrador. No more getting up and down to let him in and out whilst you are trying to relax. A sliding door dog door can even simply slot into the existing runners of your patio doors. Working as an additional panel to your current set up. The PetSafe Freedom Patio Pet Door is made up of a durable aluminium frame, that will easily fit into your existing sliding glass door runners. It is available in three colors to match your current sliding doors, with white, satin or bronze options. It also comes in four pet door sizes, so you can find the right one to fit your Labrador. This will probably be the Large size. Find out more about the PetSafe patio sliding pet door on Amazon here. If you have a screen door between your house and back yard, then you might want to consider using a dog door for screen doors instead. These are easy to install and come in a wide range of styles. Gateway’s Pet Door fits into screen doors or windows, and has a look that will match up well to most decors. It is 12 inches high by 16 inches wide, and will comfortably accommodate an adult Lab. It can also be locked and secured when not in use. This dog door for screen doors is easy to install, simply use a sharp knife to cut the appropriate sized hole and snap the dog door together from either side. It’s a popular choice, and you can read plenty of reviews on Amazon here. The Takara Pet Door for Screens works in a similar way to the Gateway door, but with a different finish. It is a slightly smaller door, measuring over 13 inches high but 12 inches wide, so if your Lab is at the larger end of the spectrum make sure you measure him before investing in this one. To install this door alone, make sure that you fit it towards the edge of the door frame so that you can reach both sides as you work. It is quick to fit, and simply requires the use of a screw driver and box cutter. The door itself has a hinged flap and magnetic closing mechanism. To find out more at the Takara Pet Dog Door for Screens, click on this link. 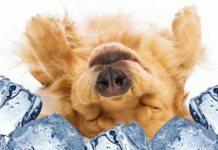 Dog doors for walls can be a more convenient option for some homes, depending upon the style of door you have and where you want your dog to be able to access in your back yard. 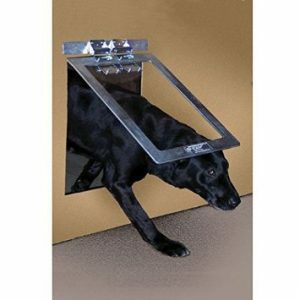 This dog door for walls by Carlson Tackle is designed to fit into your wall. It is easy to install and comes with an expandable tunnel, that allows it to fit in a wide range of walls from 4.75 to 7.5 inches. You won’t need to use a cutting frame when fitting it. When installed the opening in the wall will be 18 x 14 inches. The door itself is a sturdy construction, with a v-cam hinge system and a magnetic gasket which gives a tight seal when closed. There is also the benefit of a securing lock and stainless steel security panel, to keep your house safe when the door is not in use. When fitted this door will provide a safe and comfortable way for your dog to get in and out of the house independently. It even comes with a training tool to help your dog get used to using his new portal. Find out more about this dog door for walls on Amazon here. If you would prefer not to fit a dog door or dog flap into your existing door, you could choose to purchase a door with dog door already fitted. However, there are a number of downsides to doing this. Primarily, they are quite hard to get hold of! Your best bet would probably be to choose the front door you want and discuss your additional needs with the manufacturer. This could be a complex and lengthy process, not to mention expensive. In addition to this, hanging a door correctly is actually quite a tricky task, and far harder than cutting and fitting a dog door into an existing door in most cases. You also want the dog door to be fitted at an appropriate height for your dog. This is not something you can necessarily find ‘off the shelf’. When buying a separate dog door and installing it yourself, you will have considerably more choice when it comes to the type of dog flap your Lab would be best suited to, as well as the style of door. 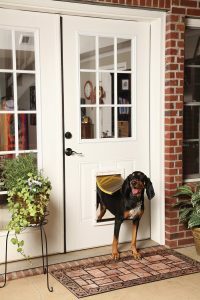 Dog door installation should be something that you can do yourself. Most dog doors come with detailed instructions, and some even have tutorial videos for fitting too. If you are unfamiliar with the use of power tools you might find it a little more difficult, but why not use this as a great opportunity to give it a go? For those who are unable to do it themselves, then your local handyman will have no problem fitting it for you. The job should take less than an hour of their time for a door installation, and a little longer for wall mounting. Just make sure that you get a fixed price for the job before they begin. My dog is getting bigger, so we’ve been looking around into installing a dog door in our home. I’m really interested in the weather dog door you’ve listed on your article. By getting this kind, I know that air in my home won’t escape through the pet door. I really like the idea for a dog door that fits into the screen. Our labs like to side outside on the deck and then come in, but it’s a pain to constantly have to let them in and out of the house. I think the screen door option would be really great because you can still have the security of your doors while keeping bugs and other insects out of your home. I have a sliding glass door that opens onto the back yard, and I have been extremely happy with the pop in panel that matches the aluminum and is easily removable, but still lockable. It began as a medium cat door, but all my dogs under 80 pounds learned to use it by watching the cats. Since I expect my six month old Lab puppy to grow to 80-90 pounds, (since he is 65 lbs at 6 months) I just replaced the medium pop in door with a larger size. I was worried that the cats wouldn’t be able to use it since the opening is much higher off the floor than they were used to, but soon everyone figured it out. (Foster Smith catalog) You can permanently attach the panel to your door’s frame if you want to.